Netanyahu visits Givat Assaf, scene of Hamas shooting attack that killed two. Local officials urge PM to bar Palestinian traffic in area. 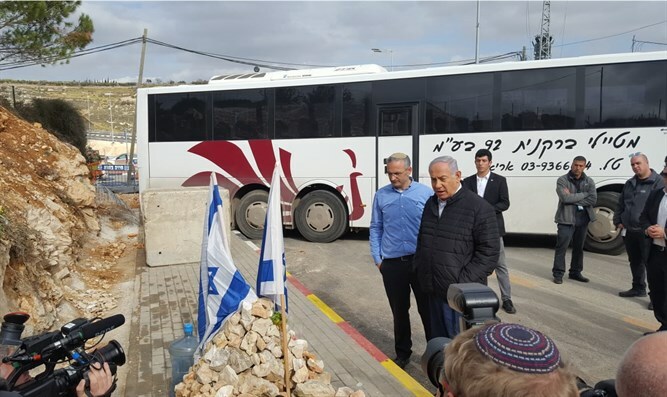 Israeli Prime Minister Binyamin Netanyahu visited Givat Assaf Junction on Route 60 Tuesday, the scene of a deadly terror attack on a group of Israelis last week. Terrorists shot and killed two soldiers at Givat Assaf last Thursday, and wounded two more, including one civilian and one IDF soldier. During his visit to Givat Assaf Junction, Netanyahu was accompanied by the mayor of the nearby Israeli town of Beit El, Shai Alon. Alon urged Netanyahu not to reopen the access road between Route 60 and Ramallah – which passes through Givat Assaf Junction and near the town of Beit El – to Palestinian vehicles. Arab terrorists struck multiple targets in the Binyamin region of Samaria last week, including a drive-by shooting attack at a bus stop outside of Ofra last Sunday which wounded seven and led to the death of a baby born prematurely. On Thursday, following a stabbing attack in the Old City of Jerusalem, terrorists opened fire on a group of Israelis at Givat Assaf Junction, killing two and wounding two, following by a ramming attack near Ramallah which left one soldier injured. Most of the attacks last week were attributed to Hamas terror cells operating out of the Ramallah area. Givat Assaf, located roughly two miles southeast of Beit El, was established in 2001 near Route 60, following the murder of Ofra resident Assaf Hershkovitz. Hershkovitz was gunned down by Arab terrorists during the Second Intifada.